Introduction : Seven obese patients, all bearing a diagnosis of primary hypothyroidism, presented to an endocrine clinic in Kolkata with complaints of snoring, choking spells at night and daytime sleepiness. A putative diagnosis of sleep apnea was made and patients were monitored for improvement in their symptoms with CPAP therapy, and thyroxine was stopped in all patients. Setting : Private hospital and endocrine clinic. Material And Methods : Patients were with full night poly somnography using both respiratory and neuro channels. A split-night protocol was followed if significant hypopnea/apneas were observed, whereupon therapy with CPAP was instituted in the second half of the night. Results : We found that all 7 patients had severe obstructive sleep apnea and treatment with CPAP improved oxygenation and main tained deep sleep. Four patients were found to be euthyroid. Conclusion : CPAP therapy is effective for management of Obstructive Sleep Apnea syndrome and patients are often mistakenly diagnosed as hypothyroid. Introduction : Traditional herbs from India have been tested in Diabetes for more than 200 years but classical trials in modern medicine are rare. 4 classic herbs have been combined essentially in a fibre based lifestyle approach of Dia No a polyherbal preparation containing water extracts of 500mg of Syzygium Jambolanum (500 mg), Trigonella Foenum Graceu (500 mg), Melia Azadirachta (500 mg) and Phyllanthus Emblica (625 mg). The classical cohort of Mild Obese type 2 Diabetes was enrolled for this preliminary study for efficacy and safety. Methods And Materials : 30 consecutive subjects were randomly assigned to the study group after meeting the inclusion and exclusion criteria. After approval by the ethics committee selected subjects were given strict lifestyle advice by a RD and were administered Dia-No 1 tablets before food twice a day. The auxology, metabolic profile FBG, PPBG and HBA1c as well as lipid profile was done pre and post therapy after 3 months. For safety Renal Function and Liver functions were also monitored. Results : The study group had 16 males and 14 females with mean age of 54 years. The mean weight pre therapy was 66 kg and post therapy 64 kg which was not statistically significant. The pre therapy Mean FBG =179mg%, Mean PPBG=284 mg% and Glycosylated Hb = 9.6%. The post therapy mean FBG was = 128 mg%, Mean PPBG = 180 mg% and Glycosylated Hb = 7.1% which had a p<0.001 statistically significant. The waist kinetics and lipid profile also statistically improved. 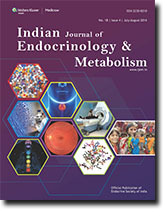 Conclusion : A simple traditional 4 herb formulation of Methi, Amla, Neem and Jamun with lifestyle is effective in controlling glycemia dyslipidemia in Obese Mild Type 2 Asian Indian Diabetics. Osteoporosis is defined as a systemic skeletal disorder characterized by low bone mass and microarchitectural deterioration of bone tissue with a consequent increase in bone fragility and susceptibility to fracture. Recent advances in the understanding of bone biology have improved the therapeutic options for osteoporosis. Management strategies for osteoporosis include nonpharmacological and pharmacological measures. Nonpharmacological measures (diet, exercise, smoking cessation) are recommendd for all patients regardless of BMD. Pharmacological interventions are expensive and should therefore be targeted to those at high risk of fractures. These drugs act on the bone remodeling cycle, where they either decrease bone remodelimg (anticatabolics) or increase bone remodeling and formation (anabolics). Bisphosphonates are the most potent antiresorptives available, of which, alendronate and risedronate are the most commonly used and form the first line of drugs for postmenopausal and corticosteroid induced osteoporosis. Ibandronate, a recently introduced newer bishosphonate, is another promising agent. Other anticatabolics in use are Calcitonin, Hormone Replacement Therapy (HRT) and Selective Estrogen Receptor Modulaters (SERMS). These are commonly used in patients with mild to moderate degree of osteoporosis. The anabolic agent commonly in use is Parathyroid homone, Teriparatide (1-34). Its use is recommended in severe osteoporosis. Regardless of mode of treatment adequate calcium and vitamin D intake is mandatory. Response to treatment is monitored by measuring bone turnover makers and Bone mineral Density. Despite all these measures the fracture risk is reduced only by 50 â€“ 60%, thus still greater research is required in this field. Endocrine abnormalities are an uncommon accompaniment of Antiphospholipid syndrome. We describe this rare syndrome in association with a triad of diabetes, subclinical hypothyroidism and adrenal insufficieny. A 37 year old diabetic male presented with complaints of recurrent hypoglycemias and a decline in the requirement of his antidiabetic medications. He had a history of hyperpigmentation and recurrent abdominal pain, which had improved with seteroids. He had been having chronic non healing bilateral lower limb venous ulcers with recurrent crural deep venous thrombosis. History and investigations suggested repeated episodes of pulmonary thromboembolism. His present clinical status showed evidence of right heart failure and pulmonary arterial hypertension. Investigations confirmed the diagnosis of primary antiphospholipid syndrome. Endocrine abnormalities included cortisol insufficiency with bilateral adrenal atrophy and a primary subclinical hypothyroidism with mildly positive antithyroid peroxidase antibodies. He had a type 2 diabetes mellitus with a positive family history of diabetes and a negative anti GAD autoantibody screen. Thus our patient had type 2 diabetes, cortisol insufficiency and primary subclinical hypothyroidism. To the best of our knowledge, this combination of endocrine abnormalities is being described in association with primary APS for the first time. This is a report of a 50-year-old man with diabetes who complained of reversible increased intensity of light after the use of sildenafil for erectile dysfunction. A 15 year old girl with type 1 diabetes mellitus had Rosai-Dorfman disease six years before the onset of diabetes mellitus. Possible common etiological role of Epstein Barr virus in both conditions is considered. Some of the elderly diabetic patients do not have classical features of type 2 diabetes. Significant proportion of them may be having autoimmune diabetes of adults (LADA), which usually makes patient insulin dependant within three years. Some of these asymptomatic patients may be detected to have chronic pancreatitis on routine imaging. We report herewith an unusual case with features suggestive of atrophic chronic pancreatitis on imaging, with auto-antibodies positive for LADA and still with good glycaemic control on small dose of secretagogue for more than 8 years which is against diagnosis of both pancreatic diabetes and LADA.